Cristiano Ronaldo has scored his 10th Serie A goal this season in only 14 games for Juventus. 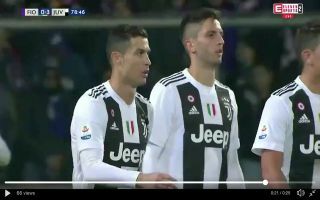 Ronaldo reached the milestone with a penalty against Fiorentina this evening. In the 78th minute of the tie Fiorentina’s Edimilson Fernandes – on loan from Premier League side West Ham conceded a penalty with a handball in the area. Ronaldo confidently stepped up and smashed the ball into the back of the net, the goalkeeper had absolutely no chance of saving the penalty whatsoever – CR7 rifled in the ball with his blistering power. Cristiano Ronaldo steps up to take the penalty for Juve and what a finish that is ?